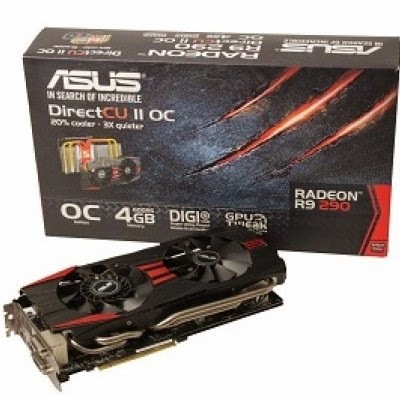 GPU Card. With DirectCU II cooling, the temperature is expected R9-290 series that normally reside in the figure above 90 degrees Celsius during peak load can be reduced. With 4 heatpipes connected with two fans and a backplate that is embedded in the back of the graphics card is expected to provide more efficient cooling performance than standard or reference cooler. Another unique feature is the power indicator light on 8pin and 6 pin. When the PSU in the living conditions and we forgot to install an 8-pin and 6 pin power, the light will turn red, while when power 8 pin and 6-pin installed, the light will turn green. Of aesthetic value, this also be a plus itself. While based on the performance of the results of tests conducted, the results obtained can not be said to be special given the price offered is more expensive than its competitors that have lower prices but with higher performance. However, for those who are loyal to products from ASUS would it not be a problem because ASUS is famous for good after sales. This certainly be one of the factors considerations for prospective buyers. Although the resulting temperature is still quite high at the time of testing, which had exceeded 85 degrees during testing Metro Last Light, but DirectCU II is still able to provide cooling with minimal noise. Should be held up to it. When the editors of CHIP tried to overclock by changing the core clock of 1000MHz to 1050MHz and memory clock of 1260MHz to 1350MHz which then testing Metro Last Light resulting temperature rises to 90 degrees Celsius. Even so, it still sounds silent fan. So the privilege of graphics card is still able to withstand the cooling heat load to keep the noise level. So that users can still optimize the performance of graphics cards is through overclock without worrying about the temperature problem and the level of noise. VGA is perfect for gamers who only plan to use a single gpu. Through tests, VGA is suitable for heavy games. 6 pin to 8 pin converter, DVD drivers and software, Manual.